There are so many options on the market from a number of different automakers, that it can be difficult to decide among them. You may be factoring cost, features and a host of other characteristics to help you decide, but the first thing you must consider is your lifestyle needs. 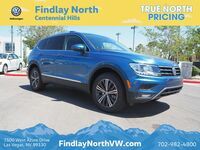 The 2016 Volkswagen Tiguan in Las Vegas NV isn’t just an economy model for the modern-day soccer mom, but for those who are looking for an affordable luxury option. It has plenty of features and benefits, but won’t break the bank. Besides providing a premium option to the market, one benefit of driving a model that sits on the border between economy and luxury is that it doesn’t have an underpowered engine that leaves it on par with most compact cars. The Tiguan is for those who love to drive, and this can be felt when you unleash the 200 horsepower of the 2.0-liter turbo four-cylinder engine. Pair it with a standard six-speed automatic transmission and it’s a smooth shifter that will never leave you struggling at highway speeds. A cramped space would go against the luxury theme, so naturally the Tiguan provides a roomy interior that seats five. Passenger volume sits at 95.4 cubic feet, which should offer plenty of legroom for the front and rear. You can also bring along bulky sporting gear with 23.8 cubic feet of cargo space. Part of the reason shoppers choose the Tiguan over other options is because of its selection of luxury features. New across the lineup is the MIB II infotainment system, which comes standard with a 5-inch resistive touchscreen but is available in the 6.3-inch capacitive screen with App-Connect features. What makes an SUV most enjoyable is improved capabilities over smaller options. 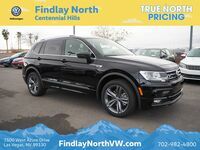 The Tiguan has a standard 2.0-liter turbocharged 4-cylinder engine that delivers 200 horsepower and 207 pound-feet of torque, providing a spirited driving style. Paired with it is a six-speed automatic transmission. For the 2016 model year, you have a few options when it comes to the Volkswagen Tiguan. First, you have to decide between the understated styling of the standard 2.0T, and the edgier appearance of the R-Line trim. There are four trims total, each of which offer a variety of options when it comes to styling, technology and safety features. Once you pick a trim, you also have to decide whether you prefer the front-wheel drive option or the stability offered by the optional 4Motion AWD system. When it comes to choices, you aren’t at all limited. The first thing you may notice is the exterior styling, but you’ll fall in love once you take a seat in the cabin. Standard V-Tex leatherette upholstery gives a premium feel while being easy to maintain, while heated front seats and windshield washer nozzles help maintain visibility no matter what the weather is like. Other standard features include keyless access with push-button start, Bluetooth with audio streaming and a rearview camera system. 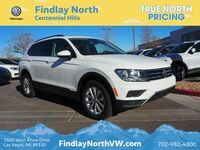 Between impressive features, a wide-range of options and a dynamic driving style, the 2016 Volkswagen Tiguan has plenty to offer. Schedule a test drive to see it for yourself, or contact us with any specific questions.